The group of LiteForex companies was incorporated in 2005 on the Marshall Islands. It is regulated following the Marshall Islands Business Corporation Act. Moreover, Liteforex Europe Limited is registered in the role of a Cyprus Investment Firm (CIF) and is stringently regulated by CySEC, finding its European address in Limassol. LiteForex takes great pride in being the primary company to initiate the cent accounts service, epitomising the lowest deposits, which are as tiny as $1. This unmatched step made Forex trading accessible for multitudes of customers and presented a sea change in the historical development of the Forex market. By providing transparent and advantageous trading conditions, as well as a huge array of services (incl. ECN, STP, and cent accounts), nowadays, LiteForex is a trustworthy international brokerage that has the honour to serve investors from all parts of the world and from all walks of life. These investors obtain access to a diversity of common trading tools, including world stock indices, precious metals, oil, cross-rates, currency pairs, and, of course, CFDs. Trading orders are executed at high speeds at LiteForex, and there are low spreads and one-click trading. Irrespective of your trading experience or preferences, LiteForex has crafted a great array of trading accounts to serve any demanding needs. Let’s start with the ECN account whose minimum deposit is $50 and yields 7.5% per annum in the investor’s account. Besides that, it revolves around a maximum leverage of 400:1, no conflict of interests, increased quoting precision, No Limit & Stop levels, as well as unlimited transaction duration. LiteForex’s ECN account also greatly benefits from a social trading platform, news trading and scalping, order market execution having no requotes, as well as trades that are delivered straight to liquidity providers. The Classic account at LiteForex also has a minimum deposit sum of $50 and a deposit bonus of 30%. Its maximum leverage is up to 500:1 and benefits from 3.5% per annum that go straight to the customer’s account. The other perks are increased quoting precision, a broad range of trading platforms, No Limit & Stop Levels, no requotes and market execution, and a couple of applicable bonuses (only for customers of LiteForex Investments Limited). LiteForex’s Cent account is characterised by a minimum deposit of only $10, 30% deposit bonus, and a whopping 1,000:1 leverage. There are applicable bonuses (Bonus Go, Pips Bonus, Non-stop Bonus) only available for LiteForex Investments Limited’s clients, the opportunity to engage trades in micro lots whose contract size is just $1,000. There are no commissions for any of the accounts and all of them can be turned into swap-free Islamic accounts. Not only LiteForex provides the most common platforms for Forex trading – MetaTrader 4 and MetaTrader 5 – but it also provides its customers with the opportunity to utilise the MetaTrader 4 WebTerminal which necessitates no downloading whatsoever. MetaTrader 4 may be downloaded for Mac, Android, iOS, and Windows. Generally, it is a platform that helps analyse the financial markets. With MT4, there are opportunities for any investors with all sorts of skills and levels. Among other tools, it is equipped with signals, enabling individuals to copy trading strategies and techniques from the most successful traders in the niche. Additionally, MT4 offers its clients a huge diversity of expert advisors, as well as mobile applications for other areas related to financial investments. The platform is gratuitous and can be downloaded from the website of MetaQuotes. It is deemed as the best owing both to its perks and bonuses, as well as to the resources that permit traders to use automated trading techniques, manage trade, and explore the movement of currencies. MetaTrader 5 (MT5) is the newer version of MT4. It is armed with enhanced functionality and a much richer set of tools. These include professional tools excellent for technical analysis (indicators, tools, charting), trading signals and copy trading (allows for subscribing to a successful trader), virtual hosting or VPS (permits trading even when the computer device is off), and fundamental analysis thanks to news reports, delivered by a diverse set of international news agencies, and an economic calendar. With the MetaTrader 4 terminal, investors can enjoy the flexibility and convenience of trading without any downloads and it is available for all LiteForex accounts. LiteForex is not an exception to the rule that Forex brokerages put a great amount of effort into solidifying the safety and security of their respected customers. Not only the company is regulated by authorities from the Marshall Islands but all its operations are subject to regulations and stipulations of the European Union, including the laws of Cyprus. Further delivering a good night sleep to LiteForex’s customers is the Investor Compensation Fund that not only covers services but also customers and their cash up to a maximum extent of €20,000. The Forex enterprise’s highly skilled team of professionals, equipped with friendly attitude and attentiveness, is accessible 24/5 via a live help, an e-mail, and through a telephone assistance. In addition, it does provide customers with the handy option of requesting a callback. The command centre of LiteForex is in Limassol, Cyprus, and the website of the broker comes in English, Arabic, Malay, Russian, Indonesian, German, Portuguese, Spanish, French, Vietnamese, Polish, Thai, Italian, and Chinese. LiteForex (ex. Mayzus) is committed to reimbursing all deposit commissions for any payment method. Only customers that have been registered and verified are able to deposit cash into their trading accounts. The process of depositing passes through a Secure Client Cabinet, safeguarding complete financial data security. VISA, JCB, Delta, Diners Club, MasterCard, and MoneyPolo are the bank cards with which LiteForex operates and whose minimum amount should be $10. Bank Wires are also set to a minimum of $10. The electronic payments comprise of OKPAY (including Bitcoin and Litecoin), Skrill, MoneyPolo Payment Account, Qiwi, NETELLER, and WebMoney – all with a minimum deposit of $1. Western Union, Contact, and Internal Transfers are other alternative payment options. 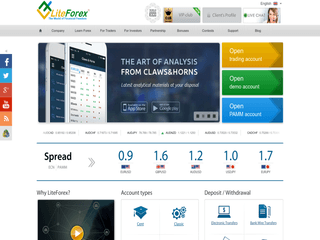 LiteForex is jam-packed with bonuses that pamper any of its ardent traders. Referring a friend will yield a 10% withdrawable bonus both for you and your friend (on the condition he/she tops up his/her ECN account). There is the amazing Forex rebate programme at LiteForex that promises up to 40% returns of spreads or $4 rebate per lot for any kind of trading instrument (rebate is, in fact, actual cash that can be withdrawn or used for trading). For LiteForex Investments Limited’s eager clients, there are three more bonuses – a Pips Back (Forex spread rebates for VIP members), a Non-Stop bonus (a welcome bonus), and a Bonus GO 200% (for every deposit of over $100, you can claim a 200% unlimited bonus).